Pesto is food changing. I mean does it even have to be classified as a sauce or is it perfectly fine just to spoon it into your mouth? Let’s compromise then by slathering all of your food in a hefty coat of this amazingly tasty, yet frightenly green sauce. Don’t let the color fool you, it.is.amazing. While I may have spooned some or a lot of this delicious green sauce into my mouth the reality is that it is stuffed full of super, extra-healthy ingredients. 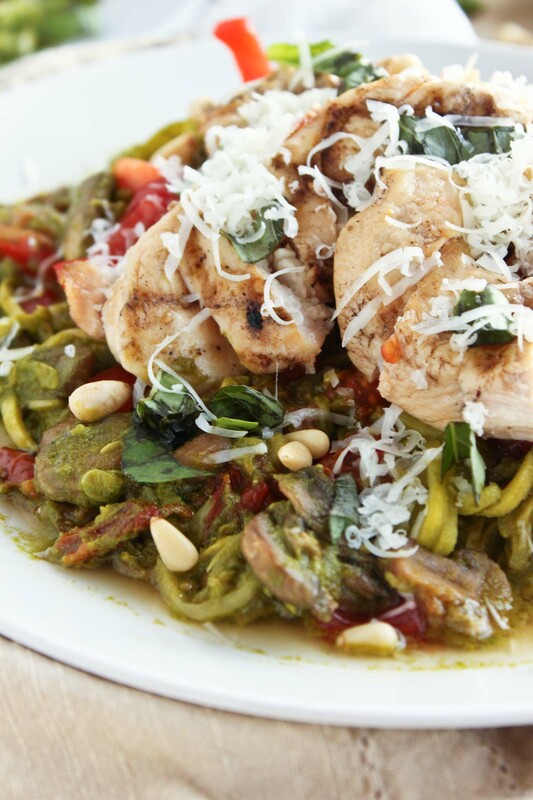 This is pesto and ultimately the best way to getting ample amounts of vegetables, with flavor. I’m not going to be a hypocrite and tell you I love spinach. In fact, spinach and kale are two veggies that are on the verge of my hate list. I mean I’ll eat it, but I wouldn’t necessarily pick it or frankly enjoy it. Buuuuuuut, kale and spinach inside pesto, fair game and give me more please. 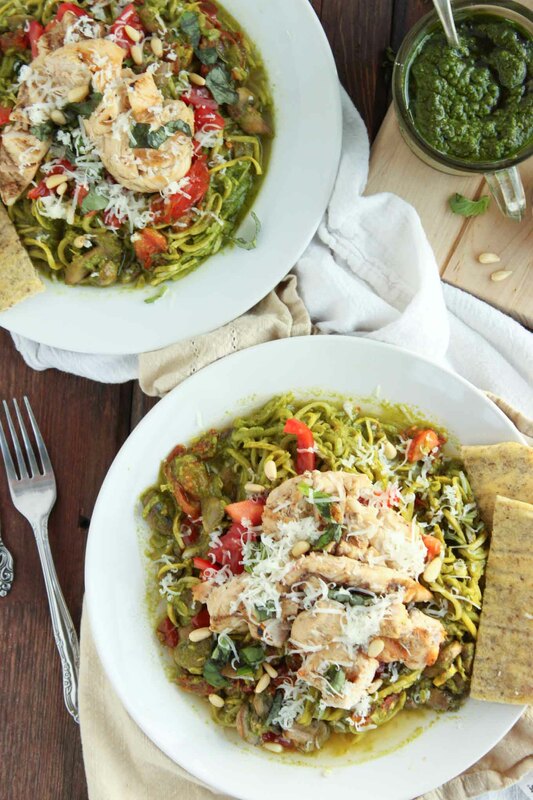 Not to mention you are slathering this amazingly delicious green sauce on top of a plate full of spiralized zucchini noodles with sautéed garlic mushrooms and roasted olive oil along with a dose of sun-dried tomatoes and red pepper flakes. Pinch yourself. This isn’t a dream. I mean that is just 10 uses off the top of my head. 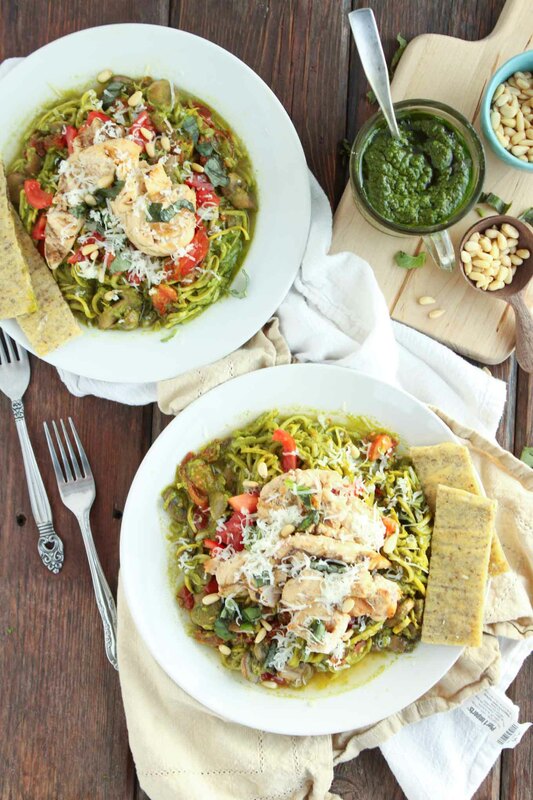 One batch will last multiple meals, so be creative and get your pesto on. The health benefits of this dish far surpass words. 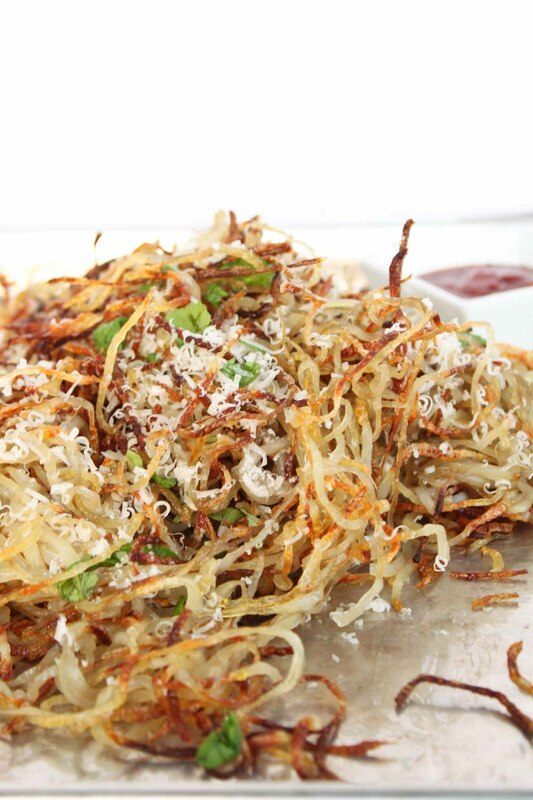 The nutrient density and satiety factor of this dish make it pretty irresistible. So my recommendation, don’t resist it. Make it, eat it, and enjoy every second of it…and then lick your plate. I mean it’s only the most amazing rendition of kale, spinach and basil on the planet so don’t be bashful. A quick 30 minute meal made in one pan and the blender. Pesto perfection. To make pesto place all ingredients in a blender or food processor and puree until smooth. Set aside. 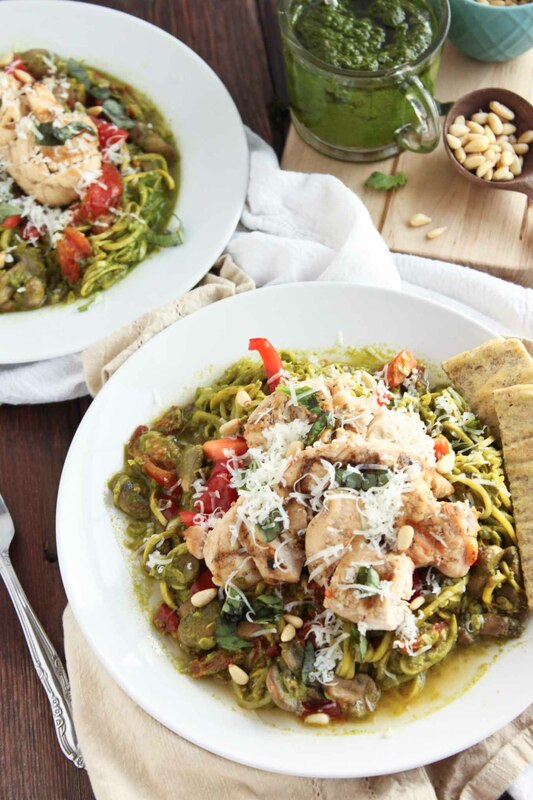 Make zucchini noodles using a spiralizer or with a potato peeler. Salt and lay on a towel to dry. Add 1 Tbsp olive oil to a hot skillet and add in noodles. Cook until softened to your liking (may need to be done in batches). Meanwhile, salt and pepper both sides of chicken breasts and grill until done. Add in additional olive oil, mushrooms and garlic to hot skillet. Cook until mushrooms have softened. Add in halved cherry tomatoes and additional olive oil if needed. Cook until just beginning to wilt. Add back in noodles and top with pesto, salt & pepper and red pepper flakes. Serve with sliced chicken and garnish with additional parmesan cheese, pine nuts, chopped basil and extra red pepper flakes.